For skin problems. 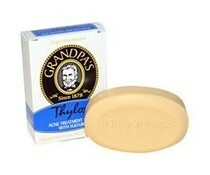 Helps prevent the development of new skin problems. For external use only. • Using topical acne medication at the same time or immediately following the use of this product may increase dryness or irritation of the skin. If this occurs, only one medication should be used unless directed by a doctor. • Avoid contact with eyes. If excessive skin irritation develops or increases, discontinue use and consult a doctor. • Keep out of the reach of children. • If swallowed, get medical help or contact a Poison Control center right away.